The BC-L70A can charge the BP-FLX75 Olivine lithium-ion battery in only 65 minutes. It is also capable of simultaneous, continuous charging of up to two lithium-ion* battery packs. The BC-L70A has the same light weight and compact dimensions as its predecessor, the BC-L70. * The BC-L70A cannot charge nickel metal hydride battery packs BP-M50 or BPM100. The BC-L70A features an advanced charging system that allows quick, efficient charging; up to two battery packs can be attached and charged simultaneously. The BC-L70A is compact, lightweight and easy to carry. The BC-L70A checks connected battery packs for abnormalities. Orange and green indicators will flash alternately if a battery pack cannot be charged normally. The orange indicator lights to show when a battery pack is charged less than 80%, and the green one when it is charged to 80% or more. 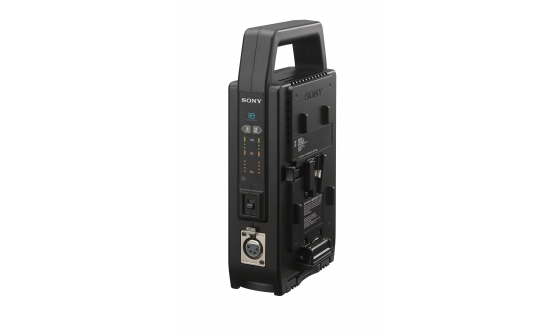 Should the AC power cord be accidentally unplugged from the AC power source, a charged lithium-ion battery pack attached to the BC-L70A provides an alternate back-up power to the connected device.